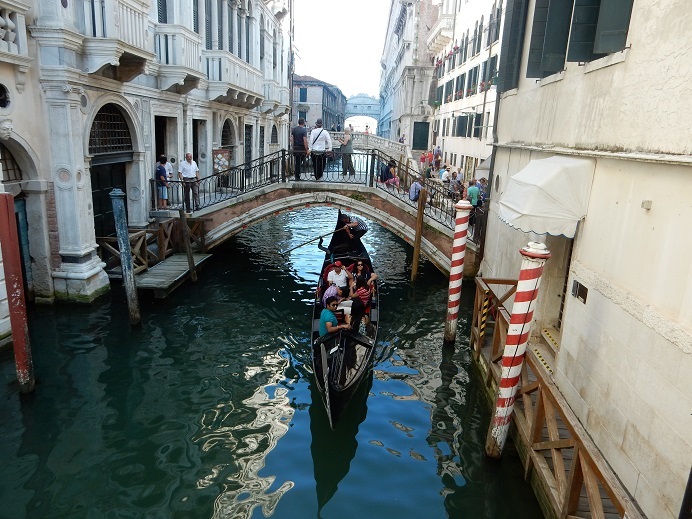 At times, the Grand Canal in Venice looks like a typical congested interstate highway. Vaporettos (water buses) – Venice’s public transit system, gondolas and water taxis all jockey for position to and from the island. After dodging Vespas and Smart Cars in Rome, it is a relief to go on shore to a car-less destination. Our overnight stay at Hotel Ai Do Mori was just minutes from St. Mark’s Square, and our room had a view of the street and the bell tower. Except for the church bell ringing early the next morning, we didn’t hear any of the street noise while we were in our rooms. Lovely. We got around the city “streets” on foot via narrow pedestrian walkways and bridges. Right after we checked in, we went out for lunch. Then, we were in search of a gondola ride. We passed street vendors hawking their wares. Suddenly, a vendor ran past us, talking excitedly on his cell phone. Apparently, he was alerting the other vendors that police were patrolling the area. One vendor hid behind a cart near us and watched as police entered and then left the square. Within minutes, all vendors were back, and it was business as usual. There were several gondoliers hanging out by the docks. We hopped aboard along with our youngest daughter and her husband. Our oldest daughter, her husband and their two children rode in a separate gondola. During the day, a 40-minute ride cost 80 euros. You could divide the cost with another willing couple if you’re on your own. The ride is more scenic and romantic at night, but the price jumps to 100 euro. “Asking to hear “O Sole Mio” (which comes from Naples) is like asking a Chicago lounge singer to sing “Swanee River,” Steves jokes. 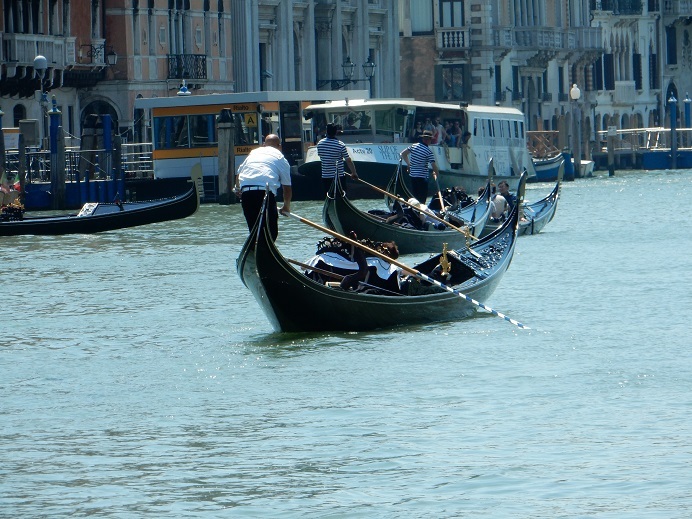 Gondoliers navigate their boats on the Grand Canal. A vaporetto (water bus) – Venice’s public transit system – is in the background. 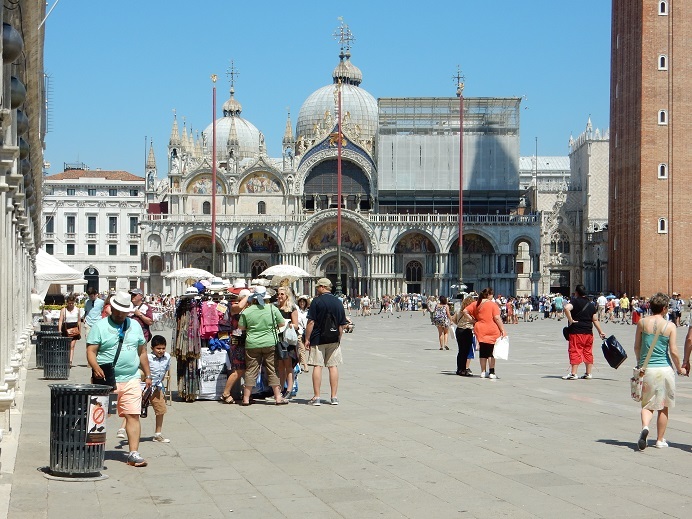 St. Mark’s Square – Music, tourists and pigeons fill the square. St. Mark’s Basilica (Basilica di San Marco) was built in the 11th century, replacing an earlier church. 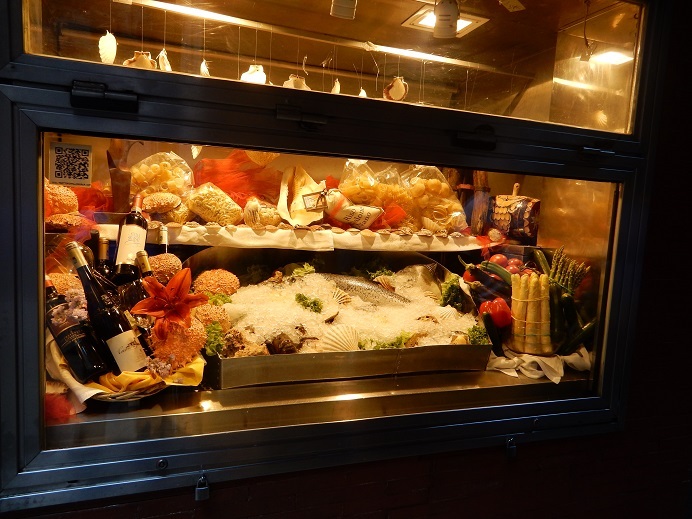 The saint’s bones have been buried here since about 830 A.D..
A close-up of the restaurant’s display window. A gondola glides under one of the many bridges on one of the quieter, small canals. Our guide pointed out many interesting and historic sites along the way. 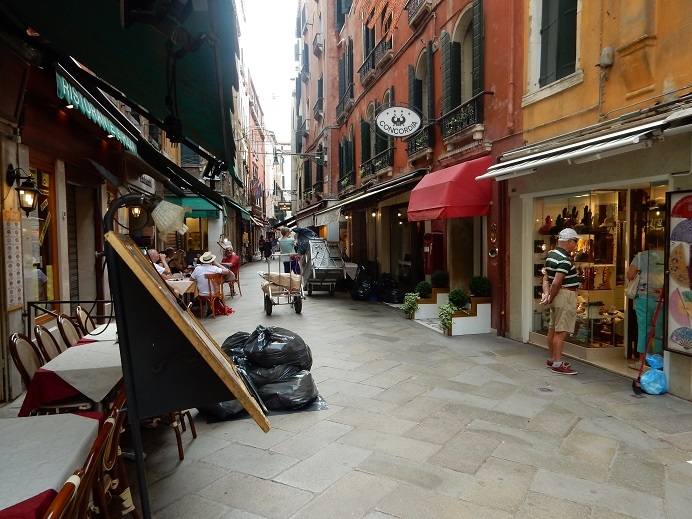 As there are no cars on Venice streets, produce and products are hauled on carts from the boats to the stores and restaurants. Early this particular morning, we saw one shop-keeper wash down the street in front of her business. We took a train from Rome to Venice – about a four-hour ride. Seats fill up quickly. So it’s a good idea to reserve them ahead of time. We did so before we left the States. Is Venice on your list of travel destinations? If not, where would you like to go? All photos were taken by me (Judy Berman) during June in Venice. 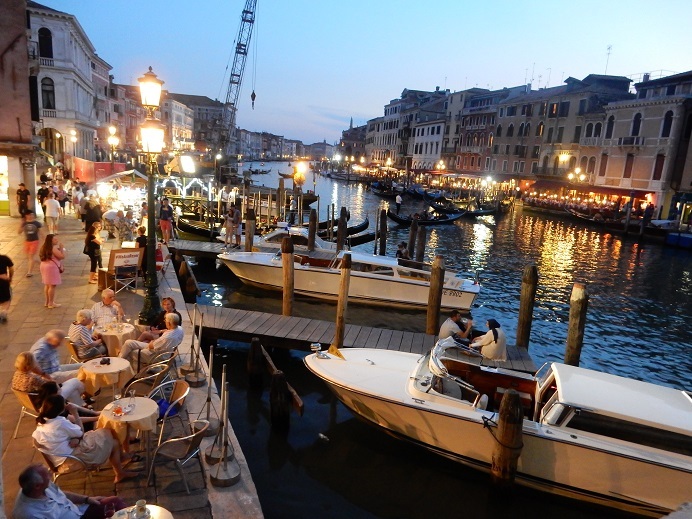 The main photo is of nightlife along the Grand Canal in Venice. If you wish to borrow any of my photos or my post, please ask first. See copyright on About page and on the side. Thanks, Carrie. We were in Venice for about 24 hours – overnight. Wish it could have been longer. We opted for the water bus. That’s supposed to be less expensive than the water taxi and we didn’t have a wait. Yes, it was a lovely trip. Totaling a rental car probably makes for a lasting memory indeed! But hopefully no one was hurt. Lovely shots, Judy. I loved Venice. Our group stayed on another island and took the Vaporetto to Venice. You are so right about strolling and finding little shops (and gelato) around a corner. So much fun. I can’t remember if we were there one night or two, but while we there at night, it started to rain. The whole plaza in front of the Basilica was flooded, and my daughter and I waded through the water to join the rest of our group to go back to our hotel. It was funny. Our hotel shower flooded our bathroom, too, and I had to borrow a nightshirt from my roommate because mine got soaked. 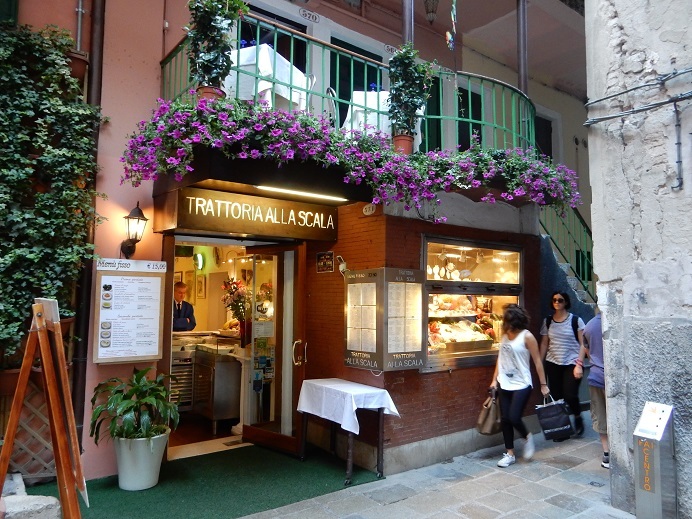 From what I’ve read, tiramisu was invented in Treviso–not too far from Venice. Our youngest daughter’s husband, who worked as a chef, said they used cocoa, not espresso. It was a wonderful dessert. Your snapshots look a lot like mine (though of better resolution since technology has improved), so I won’t beg, borrow, or steal any of yours. Rick Steve’s has been our guide through all of our European trips and has saved us heaps of dough. We took a boat ride to Murano to see the Venetian glass-blowers, but I was sorry we missed Burano (?) and the lace making. Of course, we had to have a gondola ride too! Wonderful photos and great memories. I still remember the month I spent bumming around Hawaii in the middle 70s. Sometimes I wonder why I didn’t stay. Your pictures brought back happy memories as we celebrated my husband’s significant birthday here earlier this year. We just loved getting lost amongst the narrow streets and alleyways. Our feet were sore, our pockets poorer but we had a blast! YES! I would love to visit Venice, Judy. I had a difficult time moving past your first photo. I would love to sit at one of those bistro tables. Thank you for sharing your trip with us. The photos are wonderful. We had a gondola ride four year ago , in the day , and it cost us 120 euros . I’m sure we were ripped off but it was so enjoyable we didn’t care . Where we stayed was not far from St Mark’s Square we could hear the bells , I used say ‘it’s 30 o clock again’ because the bells seemed to go on forever . It was a unique place to go to …loved it . It looks like enjoyed it too Judy . No daytime I would love to have gone at night so romantic tee hee . Rick … If you go, share the gondola ride with another couple. That will bring your cost to 40 euro – which reduces the pain of the pricey ticket somewhat. Thank you for your comments. Thank you so much for these wonderful memories, Judy. As I looked at the pictures, I began laughing. When our family was vacationing in Europe in 1970, while we were in Venice we were going to take a gondola ride, but our parents were worn out that night. I didn’t think it could be even more odd than riding in a gondola with my brother!!! !, but I was wrong. Three nuns rode with us, too, and one of the nuns was so tired that she fell asleep during the last part (she was sitting next to me), and she napped with her head on my shoulder. When she began snoring, people along the side noticed it, started pointing, and several took pictures. 🙂 It was my 15 minutes of fame…er, misery. Too funny, Marilyn. If only one of those paparazzi had shared the photos with you. 😉 Thanks for sharing. Oh, what a wonderful visit you must have had. So many memories. I took a small group there some time ago and we stayed at the Danieli. It is an amazing city and so full of mystery. Beautiful post, especially the first photo. I have read that Venice is a very beautiful city, though crowded. A colleague hails from Venice but his whole family moved to another part of Italy because they said the tourist throngs had ‘spoiled’ his home town. That tells me how lovely the city is. Maybe someday we’ll get to tour the Stanley Hotel. Erp! OK, maybe, I’d be more comfortable staying overnight at other sites in Colorado. 😉 I enjoyed your travel photos, too. Judy even as a little girl the idea of a city like Venice, (those gondoliers) had me captivated. It looks magical and I hope to see for myself one day. Thanks for sharing another part of your amazing holiday. I’m not a great swimmer myself, Suzy. But that – fortunately – never was an issue. The vendors were organized. That’s for sure. Not sure what happens if they’re caught.